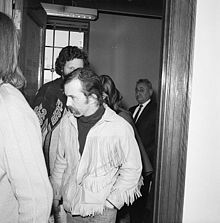 LSD manufacturer Owsley Stanley at his arraignment in 1967. Where is he now that we really need him? In case you haven’t noticed, the Middle East is exploding. Yes, I know, it’s always exploding, but this time is different. In a replay of the fitnas that raged across the Muslim world in the seventh and eighth century, the Shiite-Sunni conflict is flaring from the Persian Gulf to the Nile, threatening to bring the entire region down with it. Is an extremely ugly situation with no obvious way out. So what should the United States do in response? The only answer is to get itself out of harm’s way double quick. Nothing it does will make the situation better and, in fact, will only make it worse. So the only solution is to pull out before it finds itself badly singed as well. But it is impossible to withdraw from the Middle East without addressing what got the U.S. involved in the first place, i.e. oil. With per-capita consumption double or triple West European levels, America is far and away the heaviest major user of fossil fuels in the world. Despite the recent uptick in domestic energy production, it remains massively invested in the Middle East, not only as a consumer but as the leader of a global economy that is highly dependent on fossil fuels as well. The situation is grim, therefore, but not hopeless. If only on a technical level, the solution is actually rather easy. All the U.S. has to do to dig itself out of its hole is (a) institute a comprehensive program of carbon taxes and other reforms aimed at de-incentivizing fuel consumption and encouraging a shift to conservation and alternate energy sources and (b) re-jigger the tax code so as to preserve progressivity and insure that the burden does not fall on workers and the poor. As any competent economist will attest, human beings are highly price sensitive. Keeping prices artificially low creates the illusion that oil is cheap and abundant, no matter how much you tell them otherwise. Taxing oil and eliminating a host of hidden subsidies such as free highways and free parking drives home the point that fossil fuels are actually highly expensive once the full range of associated costs – global warming, military expenditures, etc. – are factored into the equation. Directing the resulting revenue stream to other forms of transport renders everything from trains and trolleys to walking and cycling more attractive and more competitive. Americans may claim to love their SUVs, but all you have to do is change the price structure to see how fast tastes can alter. So in the end it is rather simple. All Barack Obama, Harry Reid, and John Boehner have to do is lay the problem out, come up with a plan that is both simple and effective, and then walk it through Congress. No U.S. politician likes voting for a new tax no matter how many good causes it will fund. But no U.S. politician wants to be ensnared in a nightmare like the one unfolding in the Middle East. So once the situation has been explained, we can be confident that the people’s representatives in Washington will do the right thing by putting the country on the path to energy sanity. Thank God for LSD, eh? So much better than the dreary reality we all find ourselves in…. In fact, the chances of anything like this happening are absolute zero. If Obama were to so much as whisper the phrase “carbon tax,” the Republicans would begin firing on Fort Sumter while the Democrats would head for the hills. Not only does America’s superannuated political system render any such reform impossible, it makes it impossible even to think about it in a rational, comprehensive way, which is why no pundit who wants to be seen as practical and realistic would so much as pen an op-ed article on the subject. Global warming is accelerating while conditions in the Middle East grow more dangerous by the day. Yet both the White House and Congress are structurally incapable of doing anything other than burying their collective head in the sand. This is an old story, admittedly. But think what the consequences of such political paralysis will be. While carbon taxes would lead to higher prices at the pump, the effect on the global oil market would actually be the opposite. By putting the world’s most voracious oil consumer on a diet and inviting others to follow suit, it would send a message to producers like Saudi Arabia that the market for their sole export is shrinking. The pressure on prices would be increasingly downward. Not acting, on the other hand, sends a message that demand will continue despite the depressed capitalist economy. Prices will remain strong, while profit margins will stay healthy. Thousands of Saudi princes will rest secure in the knowledge that they can to continue blowing huge wads of cash on casinos, prostitutes, and Ferraris while arms will continue flowing to Wahhabist pro-Al Qaeda rebels in Syria. Considering that Saudi Arabia already spends an astounding 13 percent of GDP on its military – nearly fifty percent more than what Israel spends – U.S. arms manufacturers will also have the satisfaction of knowing that generations of petro-sheiks will continue buying F-16s and other baubles. But it will also means deeper involvement on the part of the Pentagon and a growing likelihood of American “boots on the ground” in Syria and elsewhere. Mobil, Exxon, and Grumman will make out very well. But more and more sons and daughters of the American working class will come home either in body bags or minus various organs and limbs, while the consequences for the masses of ordinary people in the Middle East will be even more horrendous. In a 2009 cable made public by Wikileaks, Hillary Clinton confided to her fellow diplomats that “donors in Saudi Arabia constitute the most significant source of funding to Sunni terrorist groups worldwide.” If so, then with crude currently at $105 a barrel and rising, higher in real terms than even during the oil spikes of the 1970s and early ’80s, U.S. energy policies enable them to donate even more. The effect is to fuel terrorism even as Washington launches massive domestic-monitoring operations to supposedly combat it. It’s the best of all possible worlds for militarists and authoritarians. The deepening constitutional rot in Washington is thus not only a domestic problem but an international one as well. Looking back across the decades, we’re often struck by how clever the architects of the post-war capitalist order were. Instead of the renewed depression that everyone expected (the threadbare Oceania of Orwell’s 1984 is a perfect example of this mindset), they engineered a 25-year boom that remade the world. They stumbled badly in Vietnam, but recovered sufficiently under Reagan and Bush I to vanquish the Soviets and impose law and order of a sort in the Persian Gulf. But as the economy has crumbled, the instability has deepened. Although Americans still think of him as a liberal do-gooder, Obama has done nothing to stop the drift to war. In fact, with his ready resort to drone warfare, his subservience to the Saudis, Qataris, and Turks, and his sword-rattling in Syria, he’s done everything to exacerbate it. The masses are sleepwalking over a precipice, yet so far there seems to be no way to wake them up. I think I need another hit of that acid….